You walk into the gym with a workout plan in mind and feel you should “warm up” first but what should you do and what is meant by “warming up”? As a Personal Trainer I spend a lots of time in the gym and this gives me the opportunity to observe many different types of people and other Personal Trainers. What I see appears to be wildly varying approaches to warm ups. Many of which are poorly chosen for the workout at hand. Number one can be a good thing if you find you need that long to get your self in the mood mentally. Number two screams of lack of knowing what a trainee wants to do for the day and feels they must somehow use every piece of equipment in the gym. Thumbs down. Number three is just plain stupid. A warm up should never leave you fatigued in any way. Ever. A warm up should do just that, warm you up, slightly. A physical change in the temperature of your muscles. It is the portion of a workout where you are checking to make sure all your muscles and joints feel OK for the day and you have no niggling aches or pains. It is not the place to be breathing heavy or sweating, that would indicate fatigue. Fatigue at this stage is bad. Warmed up or Worn out? Over the years as a Personal Trainer (I’m based in Epsom and work in and around London and Surrey FYI) I have determined that flexibility and mobility work, where necessary, should be carried out at the end of a workout when your muscles and joints are fully lubricated, warm and relaxed. What do I mean by “If it is necessary”? Flexibility and mobility work need only be carried out, in my experience, if a person is lacking in the basic functional requirements of a joint or muscle or if a specific movement pattern is suffering due to inflexibility or immobility and occasionally if pain is present in a joint e.g. lower back pain can sometimes be alleviated when hip flexor muscles are stretched. If one of my Personal Training clients is due into the Epsom studio today and has a 10k run planned as part of a long term program I would have them start with a walk for a few minutes which will progressively turn into a jog and then a few minutes of light running. Nothing fancy, no foam rolling or long winded mobility drills, no sweating or panting and no stretching, yet. seven 160 x X reps….. Same goes for a squat…I’d have them squat to warm up for the squat. Slowly. Kick boxing? Yup, I have them perform light practice reps of kicks, knees, punches and elbows and build up the intensity as the session moves along. Getting the picture? Warm up what you are working. This is where experience as a trainer comes in or just knowing your own body. Some people will warm up faster than others. Many factors can affect this but experience shows that the main factor is fibre types. 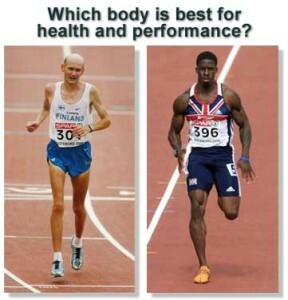 Some people have a high percentage of slow twitch muscle fibres (we all have all three main fibre types but in different ratios) that produce less force, use less fuel and are more efficient at dissipating heat with a better blood supply. These people require and desire longer warm up periods. Others may have a higher percentage of fast twitch muscle fibres and these generate more force, faster and have a lesser blood supply so tend to heat up faster and cool off more slowly. Warm ups should be kept minimal here. Slow Twitch or Fast Twitch? Knowing which type you are can be both complicated and simple, huh? I know, bear with me. Some people just know they are better than average at certain events; always been good at long distance swimming but crap at sprints? Probably fair to say you have a good percentage of slow twitch fibres (type 1 muscle fibres). Yes this is a very VERY simplified break down but it’s a good place to start and if you want to delve deeper then I suggest you find your self a well educated Personal Trainer. I have not seen many people speak of the different warm up procedures that need to be applied to different fibre types as it is a field not really explored too deeply yet but it will be. Eyes open. If you want help with your training then drop me a line via the contact page here. I am a Personal Trainer based In Epsom, Surrey but also cover areas of London too and I love helping motivated people attain their goals.